With our Pre-Listing Inspection Program, your real estate transactions just got much easier. It will eliminate the buyer's responses to inspections and help prevent transactions from falling apart due to dealing with unforeseen issues during the limited option period. Hi, my name is Kris with Viking Inspections. I am not a real estate agent, but I am here to help you maximize the equity you have in the house and tell you about an exciting program which will save you money and make your real estate transaction go smoothly. The first thing I want you to know is 90 percent of all real estate sales are subject to inspections. Currently the culture of the real estate industry is backwards. Houses are put on the market, offers are accepted, and then inspections are performed. Upon inspection, deficiencies are discovered and then buyers and sellers negotiate repairs. So, we have to negotiate twice and this process ALWAYS costs sellers money. Trust me, this process leads to frustration, can delay closings, and even leads to fall throughs. If the deal falls through, then all the time spent with the house off the market is wasted and the home selling process must start all over. And, if the deal does fall through due to inspections, then you will have to make more mortgage payments on the house. I would suggest to you that there is a better way to sell your house and it starts with having your house pre-inspected. If the house is pre-inspected, then you will not be blindsided by expensive repairs. You will be able to save money by building repair costs into the price of the house. Also, if you know about deficiencies up front you will have time to get estimates for repair costs vs. being rushed to get repairs made during the limited option periods that exist today. You can even save money by making your own repairs vs. having to hire a licensed professional. In my humble opinion, the number one reason sellers don't maximize the equity in their home and have a smooth real estate transaction is because they hire a realtor that operates in accordance with today's real estate culture vs. being proactive, like I am, and suggesting you have the house pre-inspected. Here's another stat - 70 percent of all real estate transactions in our market include a home warranty or cash towards one. Most of these warranties are 12-month glorified appliance warranties. If you have your home pre-inspected by Viking Inspections, then I can get you an 18-month home warranty for the price of 12 which covers much more than the standard 12-month warranty that other warranties offer. Not only is this warranty 6 months longer than other warranties, it also comes with a FREE FIVE-YEAR ROOF LEAK WARRANTY. I promise, having your house pre-inspected and offering this warranty will give your house a listing advantage over other houses which do not have a warranty or only offer a 12-month warranty. The warranty I am suggesting is more attractive to buyers because it covers more than other home warranties such as, sewage pumps, sump pumps, washers and dryers, an unlimited number of appliances, and much more. This 18-month warranty also covers termites, mold, and underground sewer and water lines. No other home warranty product covers as much! Since 70 percent of the time a home warranty is going to be provided, I would recommend we give your house a listing advantage by offering a brand new, premium 18-month warranty that is longer than other warranties and covers more. The fact is, there are not very many listings on the market that say the house has been pre-inspected, comes with a Five-Year Roof Leak Warranty, and Premium 18 Month Home Warranty. Let me tell you about another great advantage that our Pre-Listing Inspection Program gives sellers. The Pre-Listing Inspection Program through Viking Inspections gives you free warranty coverage on your house during the listing period. For example, if Viking Inspections performs your pre-listing inspection and issues a clear termite report but two months later termites are found, then the you get a free termite treatment. In that scenario, you just saved around $1000 dollars and the warranty more than paid for itself. Or, if Viking Inspections performs your pre-listing inspection and your dishwasher breaks during the listing period, you can file a claim with the warranty company to get it repaired. This extended listing period coverage is free with this program. The bottom line is this - my Pre-Listing Inspection/Warranty program saves sellers money, gives your house a listing advantage, eliminates fall throughs due to unknown discoveries, and gives you warranty protection while the house is listed. Since I started doing this program I have noticed that the houses which are pre-inspected and offer the 18-month warranty get over 50 percent more showings. More showings mean faster sales rates and more competing offers which translates into a higher return for you. The home warranty has simple, square footage based pricing, but the standard 18-month home warranty fee is around $595.00 and is paid at closing so you have no out of pocket expense. If the house never closes, this fee is eliminated. Again, you get FREE warranty protection while the house is listed, you do not pay for the warranty until closing, and then the 18-month warranty kicks in for the buyer at closing. The home inspection fee is mainly based on the size of the home, but also depends on ancillary services such as pool, Foundation Elevation Surveys, Infrared Thermal Scans, etc. I can tell you this about the home inspection fee though - our home inspections start at $265 and we don't charge extra for termite or sprinkler system inspections. Viking Inspections will also give you a $50.00 discount on your home inspection from us for the house you are buying. 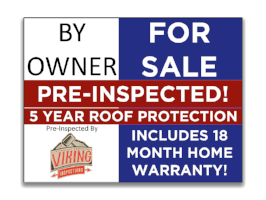 If you have Viking Inspections perform the home inspection for the house you are buying, then you will be eligible for the 18-month home warranty on that house. Ideally, these costs should be calculated into the price of the home so you wouldn't pay a dime for any of it. The seller has an opportunity to make his or her own repairs. The seller has an opportunity to build the repairs costs into the price of the house. The seller has time to shop around for the best prices to get repairs made. Eliminates unforeseen costs, negotiating twice, and deals from falling apart due to home inspections. The seller gets free warranty protection during the listing period and the home warranty starts for the buyer at closing. Example: If the inspector states the furnace is working at the time of the inspection and then it breaks during the listing period then a claim can be filed to fix the furnace. The listing has an advantage over other houses on the market which will mean more showings, more competing offers, less time with the house on the market, and higher sales prices. Use any of our free logos in your marketing materials or with your listing to promote it on social media or wherever you choose. We will create an 18" x 24" yard sign at no cost to help you promote your listing.